Yesterday, US stocks went into the worst sell-off for over past six years, due to concerns over higher interest rates. The Dow Jones Industrial Average (DJI30) dropped by 1.175 points, making it the largest drop in points in a single day, ever. US Black Monday, which occurred on October 19, 1987, was the worst day 1 in the history of the index, seeing the Dow Jones plummeting 22.6 per cent. However, in percentage terms, the 2008 plunge was far steeper, at around 7 per cent. In terms of correlation with other markets, it was no surprise that this caught on across the world, with the ASX200 (Australia's Top 200) dropping 25 per cent in response, the following day it opened. The Reserve Bank board will meet today and will most likely keep interest rates on hold at the record low 1.5 per cent. In addition, the stock downturn extended to every S&P sector. The sectors with the least losses were utilities and consumer cyclicals, dropping 1.7 and 3.3 per cent respectively. The big banks Citigroup, Goldman Sachs, and Bank of America have dropped ca. 2.5 per cent each. However, it was Wells Fargo that fell the hardest – 9.2 per cent, making it the weakest out of the 500 stocks in the S&P index, this followed the Federal Reserve decision to force Wells Fargo to replace four of its board members 2. The US Treasuries are pricing another 33 basis points (bps) rise this year, meaning the two 25bps rises are locked in, however, as we've seen in the past, rate rises can ratchet up quickly upon signs of Inflation. Currently, US Inflation 3 is in the target range of 2.1 per cent p.a. The average Price-Earnings (PE) ratio 4 is around 24 on the Dow Jones, so its historically overvalued and due for a correction given interest rate environment. If we look at the Shiller PE ratio 4 for the SP500 (the broader equities market of USA, its top 500 companies), its at 24.74, which is well above average, but not necessarily in bubble territory. 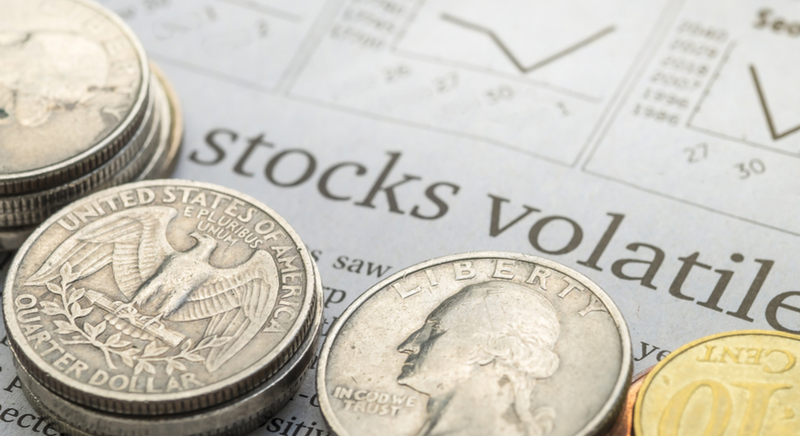 The Price to Earnings ratio or PE ratio is the main indicator to value stocks with. It essentially means, the number of years of Earnings that are required to payback the investment in purchasing the Stock. The higher the PE, the more expensive – and longer – it will take to pay-back the Stock. Normal market Valuations range between 14-16. The higher the PE the more volatile the stock is. The higher the PE the more overvalued the Stock is. During recessions PE can drop below 10. The price is currently making a retracement, trying to re-test 24209 level 14 Weekly L5 pivot. However, if it doesn't reject from W L5, we might see a retracement to the POC zone 25121-25351, where it could reject again. A drop below 23100 could target 22177.58, historical swing high. For the latest news and views from around the industry and to see top analysis and insights from our team of professional traders, check out our Real-Time Daily Trading Ideas webinars today!